On March 25, 2013 George Mason University President Dr. Ángel Cabrera held a press conference to formally announce the university’s decision to leave the Colonial Athletic Association to join the Atlantic 10 Athletic Conference (A-10). The announcement came just days after the Board of Visitors’ approval of the university's Vision document that Dr. Cabrera had overseen. Mason will begin competition in the A-10 during the 2013-2014 academic year, and Mason’s association with the institutions that comprise the A-10 will begin a new chapter in Mason athletics, academics, and other aspects of university life. The move marks an end to George Mason’s University’s membership in the Colonial Athletic Association (CAA), a conference co-founded by Mason in 1985. The CAA’s history begins in the mid-1980s when Mason was still a part of the Eastern College Athletic Conference (ECAC) South, which was a part of the ECAC’s larger group of 230 colleges and universities. The six-member ECAC South functioned as a semi-independent conference until 1985. That year Mason and other members of the ECAC South broke away to create a tighter-knit group and localize competition, as well as earn more visibility. A Proclamation of Creation was issued and signed at the University of Richmond on June 6, 1985. The new conference, the Colonial Athletic Association, was formed with Mason, James Madison University, William & Mary, University of North Carolina at Wilmington, East Carolina University, American University, the University of Richmond, and the Naval Academy as its charter members. Though the members of the fledgling CAA sacrificed an automatic bid in the National Collegiate Athletics Association (NCAA) men’s basketball tournament during its first year of existence, conference administrators saw this tradeoff as a short-term pain that would pay dividends in the future. This was soon recognized when the CAA was granted an automatic tournament bid by the NCAA the following year. In co-founding the CAA, Mason helped create a remarkably successful men’s basketball conference that produced NBA stars such as David Robinson, Blue Edwards, John Newman, and Larry Sanders and that has been well-respected for the academic accomplishments of its athletes. 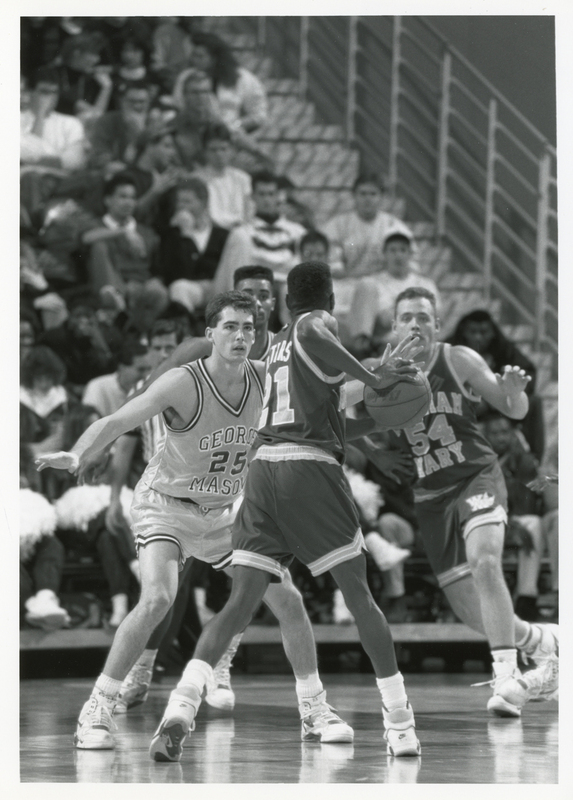 Mason first earned league laurels in the CAA and participated in the first wound of the NCAA Tournament in 1989. It went on to win three CAA championships under coach Jim Larranaga, who was given the title of CAA Coach of the Year in 1999. In 2006 the George Mason men’s basketball team, under then-head Coach Jim Larranaga, made its first appearance as an at-large bid in the NCAA tournament and continued on to the Final Four. Mason was only the second 11th seeded team to make it that far. Virginia Commonwealth University of the CAA made the Final Four in the NCAA tournament in 2011, and both Old Dominion University and Drexel University also experienced success against well-known and higher-ranked athletic programs in the tournament. After nearly 27 years and much success competing in the CAA, Mason’s decision to move to the A-10 was not one to be taken lightly. It was “one of the hardest calls I’ve ever had to make,” said Mason Vice President of Athletics, Tom O’Connor, about informing CAA commissioner Tom Yeager of Mason’s plans. “Tom Yeager is a great guy and one of my best friends in the world. But we ha[d] to move on,” he added. Mason’s move to the A-10 was not accomplished overnight. It had been in the making for more than a year. The original, informal conversations began in October of 2011 and came to a head in March of 2012, at which point former president Dr. Alan Merten, Dr. Cabrera’s predecessor, appointed a committee to explore the concept of changing conferences. For unspecified reasons, Mason chose not to leave the CAA for the 2012-2013 year. Dr. Merten retired at the end of June 2012, and in July Dr. Cabrera assumed the office of university president. At the beginning of the spring semester in January 2013, Mason once again inquired about options to apply for a move to the A-10. The proposal was taken to Dr. Cabrera, who expressed interest and formed a committee in February of internal and external members who vetted the issue. In addition to O’Connor and Adam Brick, a senior associate athletic director, two members of the Board of Visitors and several other university vice presidents were included in discussions. A meeting with Bernadette V. McGlade, the Commissioner of A-10 Conference, and Dr. Steven Knapp, the president of George Washington University—who is chairman of the A-10 Council of Presidents—took place, and it was concluded Mason was eligible to re-apply. Dr. Cabrera gave his approval to the idea, and after hearing the proposal; the Board of Visitors voiced no real objections to the move. Mason was given the go-ahead for the move and seized the opportunity decisively. Within 24 hours, Mason’s application to join the A-10 was submitted and accepted. The potential benefits of Mason moving to the A-10 were seen as outweighing any immediate drawbacks. Regrettably, seven of Mason’s spring sports programs were rendered ineligible to compete in CAA tournaments by the move, and Mason was asked to pay a one million dollar exit fee. The monetary cost of leaving was shouldered by the university and not by students, and Dr. Cabrera and O’Connor expected the move to pay financial dividends within five years or less. As for adjusting to a new conference, O’Connor didn’t foresee any difficulties, and he spoke of Mason’s upcoming competition in the A-10 with confidence. “I feel [that] in the long run… it’s not going to take a long time for those [programs] that need to upgrade, and those that are going to be successful will see that success relatively soon.” O’Connor felt that some of Mason’s sports programs will be immediately successful and will quickly establish a firm footing and prestige in the conference. Moving to the A-10 should afford Mason more media coverage than in recent years. With a television contract that includes the major networks CBS, NBC, ABC, and ESPN, the university’s visibility and exposure is seen to likely increase. Mason’s participation in the A-10 promises to be a recruitment tool in terms of both athletics and academics, as membership in a more prestigious and visible athletic conference makes a university attractive to athletes and non-athletes alike. Mason will soon be associated with other well-regarded institutions, such as Fordham University, George Washington University, University of Dayton, and the University of Richmond. It will also reunite Mason with previous conference rivals Richmond and Virginia Commonwealth, and will add another local team, George Washington, to its conference play schedule. Browse items pertaining to George Mason's participation in the Colonial Athletic Association and Atlantic Ten conference. “CAA Women’s Basketball Championship.” 1996 : n. pag. Print. George Mason University Archives. Box 11 Folder 11.8. Schwartz, D. Mason Joins the CAA. Broadside, 1985, June 24. “CAA Women’s Basketball Championship.” 1996 : n. pag. Print. “Super CAA Hoops.” 1991 : n. pag. Print. George Mason University Archives. Box 9 Folder 9.6. “George Mason University Basketball.” 1999 : n. pag. Print. George Mason University Archives. Box 18 Folder 18.12. Carroll, P., & Muraca, F. Mason announces plan to head to Atlantic 10. Broadside, 2013, April 1. Oral History Interview with Thomas O’Connor, April 19, 2013. Carroll, Pat, and Frank Muraca, . “Mason announces plan to head to Atlantic 10.”Broadside 1 Apr. 2013 : pg.10 – pg.13. Print.